Before I share this recipe with you, I want to give a shout out to the wonderfully talented Ashton from Something Swanky that I met while attending Online BlogCon. She is the artist behind my new blog design. I have been wanting a face-lift for my blog for a while now, but didn't have the know how to do it myself. So I contacted Ashton and told her what I wanted and she brought my ideas to life. Now every time I click on my page, I have a huge smile on my face. If you are looking for your own blog face-lift, check out her Etsy shop here. She has great prices, is very friendly, and does a fabulous job. Last weekend, while my Babycakes donut maker was still warm from baking my Mini Chocolate Ginger Donuts, I put together this recipe. I simply replaced the milk and vinegar in my Mini Churro Donuts, with Hood Vanilla Egg Nog and reduced the amount of sugar. I can't say I have every been a fan of egg nog. I did not grow up drinking it. I may have had some here and there. I have never had it with any alcohol added. I did have a glass while making this recipe and it was delicious, but one glass is enough. It is pretty rich and sweet. Perfect for baking though. 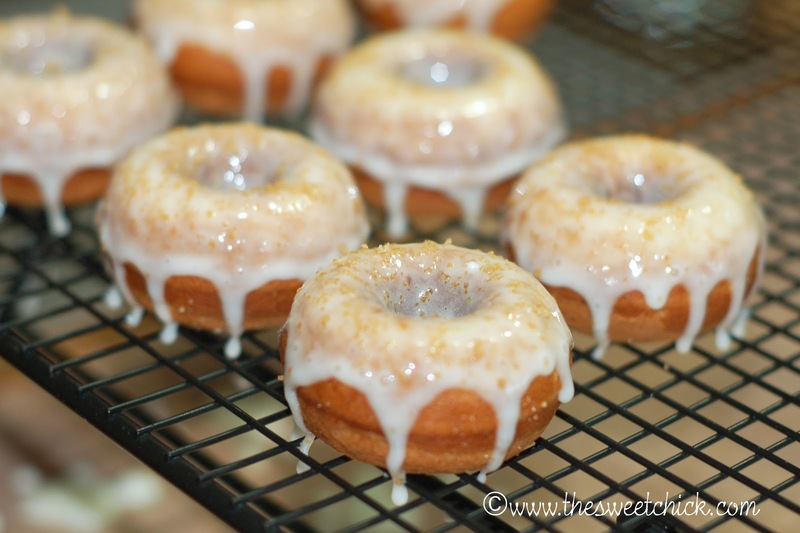 It really goes well with cinnamon and adds a moist texture and rich flavor to the donuts. I got to use my Tovolo Pancake Pen again. This time I smartened up though. I mixed my batter in my Pampered Chef batter bowl. It was much easier to pour the donut mixture in the pen this way. Ooh, just look at all those beautiful speckles of cinnamon goodness. After making the first batch, I did realize that unlike my other donuts, 2 minutes is enough baking time for these. Any more than 2 minutes and the donuts became hard and dry when cooled. Two minutes was enough time for the insides to bake and still remain moist and soft after cooled. I also replaced the milk in my regular glaze recipe for egg nog to really bring out the flavor. Oh yeah, just let the glaze drip off the sides. Tell me this doesn't make you drool right now. I sprinkled a little cinnamon sugar on top to finish them off. I didn't have any granulated sugar left, so I used brown sugar. I think I like it better for a topping because it is not so gritty. Using a hand mixer or stand mixer, beat together oil and sugar. Add eggs and vanilla. Stir in the egg nog and mix well. Stir together the flour, baking powder, baking soda, salt and cinnamon. Slowly add the dry ingredients to the wet ingredients and mix, making sure to have a nice smooth mixture. Use a piping bag, a Ziplock bag with tip cut off, or a pancake pen, to fill each donut reservoir with about 2 tbsp of batter. Bake for about 2 minutes or until toothpick inserted in center of donut comes out clean. 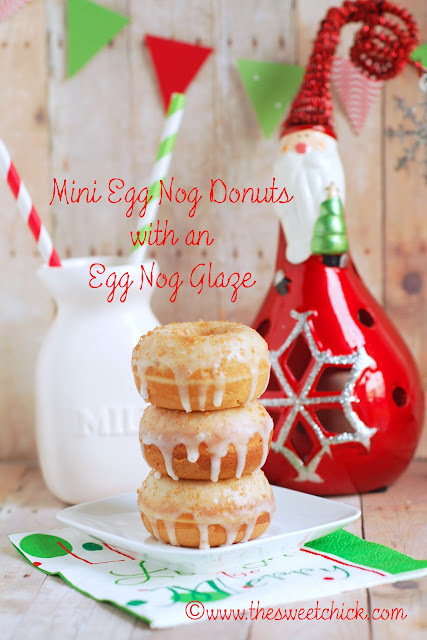 In a small bowl whisk together powdered sugar and egg nog until smooth. Mix together the brown sugar and cinnamon until well blended. 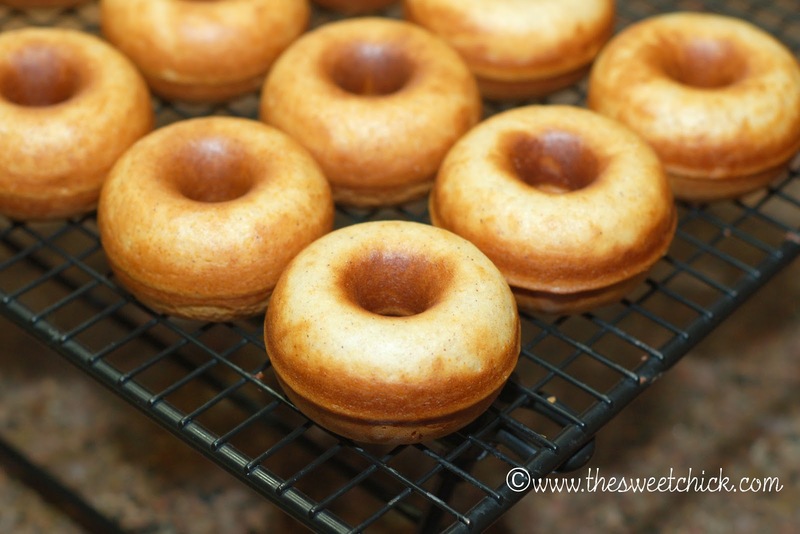 Then before glaze dries, sprinkle the tops of the donuts with the mixture. Put as little as or as much as you desire. These donuts look great, too! 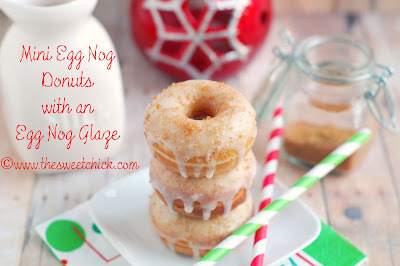 :) I am making eggnog donuts today. . .I hope they turn out as good as yours look! Thanks Jessica. Can't wait to see how yours turn out.